Often I got wallpaper collection from my friends where a number of pictures are in common and obviously its very tedious to find out duplicate pictures in a collection of large number of pictures. Nevertheless, there are software that can find out duplicates based on their filename, hashes etc. But what about near duplicate images? Almost all duplicate file search software fails to pick near duplicate images. Awesome Duplicate Photo Finder is a life saver under such circumstances. It can easily find out nearly-duplicates in a collection of images. Also It shows side-by-side previews to let you decide about the near-duplicates. It also assigns a similarity percentage among the near-duplicates. It can of course find exact duplicates. 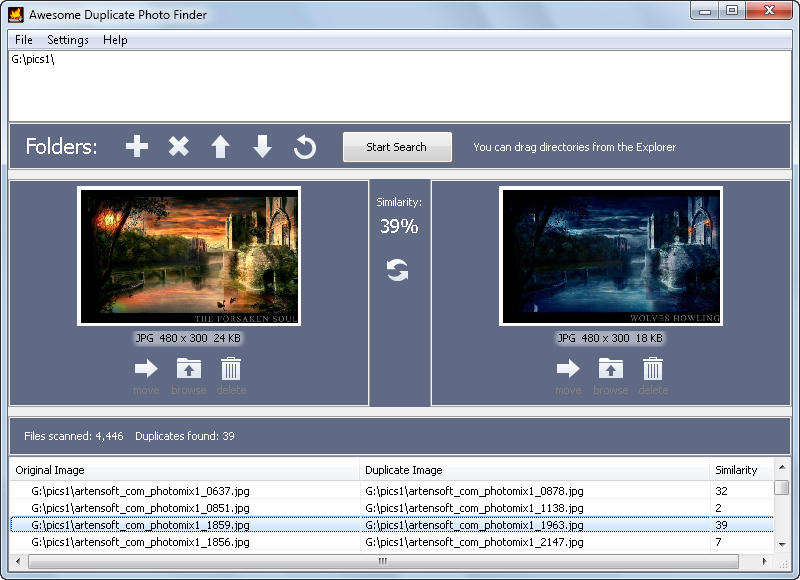 Awesome Duplicate Photo Finder may be downloaded as a installer or portable version. The portable version comes as an archive [686 Kb] containing the standalone executable and may b downloaded from the following link. The installation went on fast and clean with the creation of a desktop icon. Installation requires 2.2 Mb free disk space. You need to select the folder containing the images and click on Start Search to initiate the searching process. At search end, you will get an alert. The listed duplicate images have a similarity percentage attach with it. It is able to compare images that appears to it as having added effects like Grayscale, Negative etc. You can choose to delete either of the images or browse for it. In the settings, you can set the image types to be searched for duplicates. It supports all major image types: JPG, BMP, GIF, PNG. The software lacks any online or offline help documentation but it is too easy to use to require any help documentation. The software is light on resources at idle time and during image search it uses moderate resources. This software have a rare quality which makes it valuable. It is free of course and hence highly recommended. This entry was posted in File Management, Free, Graphics Management, Portable, Software, Windows.